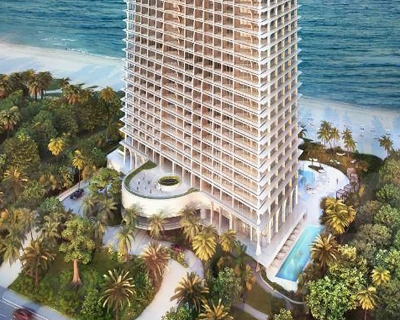 UPDATE: jade signature has just released new renderings of the luxury residence designed by herzog & de meuron, depicting more of the condominium’s placement within the beachfront urban fabric, and new details about the interior of the planned residences. 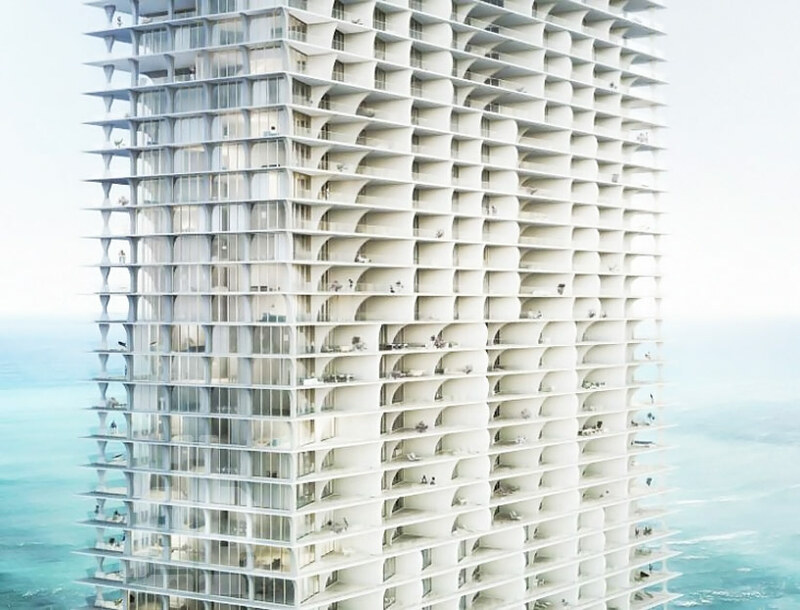 swiss pritzker prize winners herzog & de meuron will continue to flesh out the tropical destination and burgeoning artistic hub of the greater miami landscape; in lieu of a urban complex-parking garage or bayfront art museum, this time the architects will erect a 57 storey luxury condominium in the uptown miami enclave of sunny isles beach. 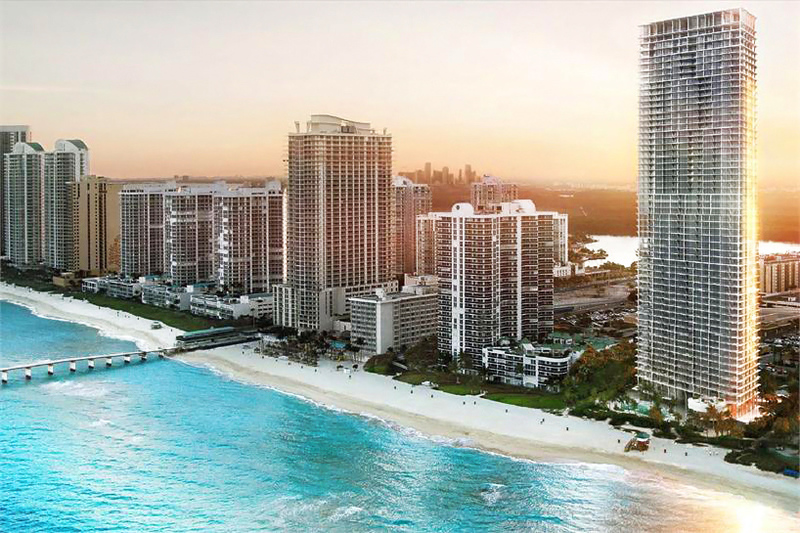 the ‘jade signature’ development is the fourth installment of the industrious fortune international-backed series. 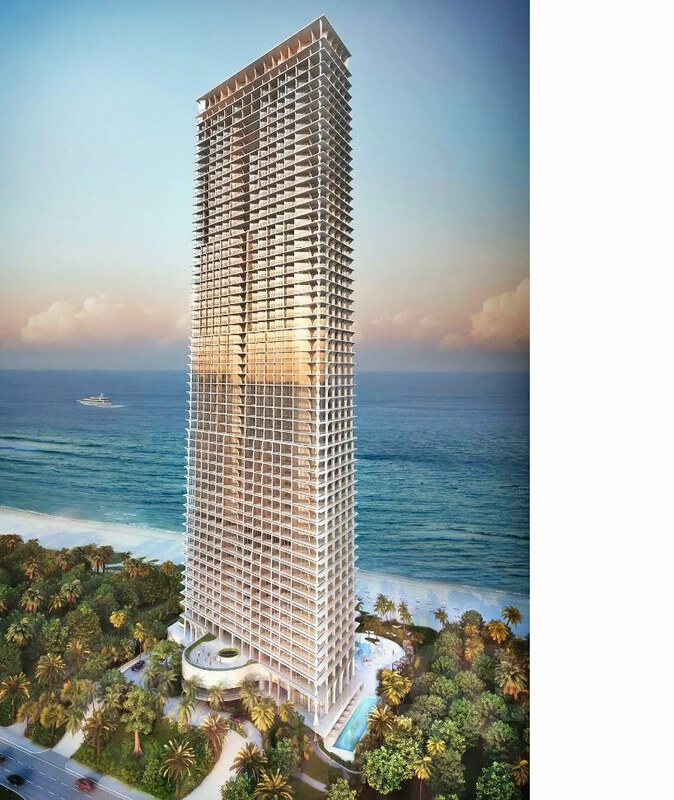 a talented team consisting of landscape architect raymond jungles and interior designer pierre yves rochon will create a total work of luxury in the parallelogram-shaped tower. three circular staircases will lead to the ample lobby while underground parking will provide a pioneering subterranean construction method for the limestone-based site. 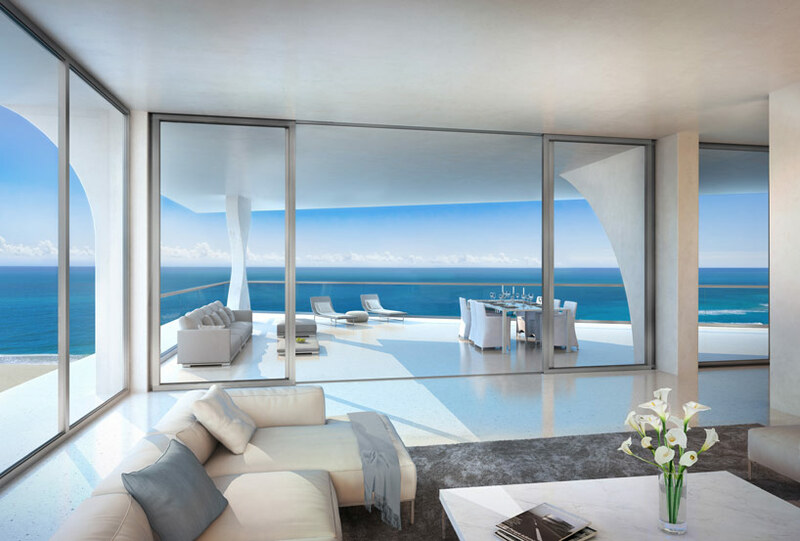 the 10-foot ceiling height individual units will reportedly range from 1 to 5 bedrooms, with a requisite amount of sky villas and signature penthouses ranging from 6,100 to 10,500 square foot total areas — veritable mansions in the sky. 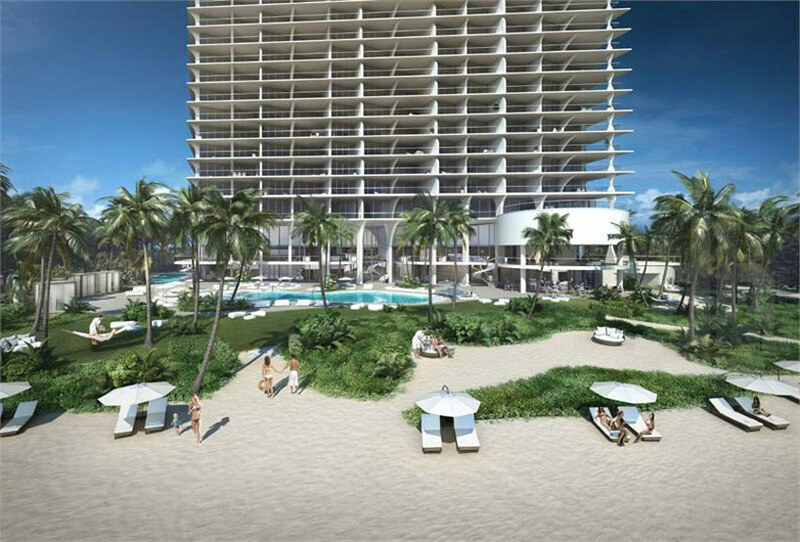 the 192 oceanfront apartment volumes and 6 guest suites are angled toward the southern sun and will enjoy views of the pristine miami coastline and eclectic urban landscape. 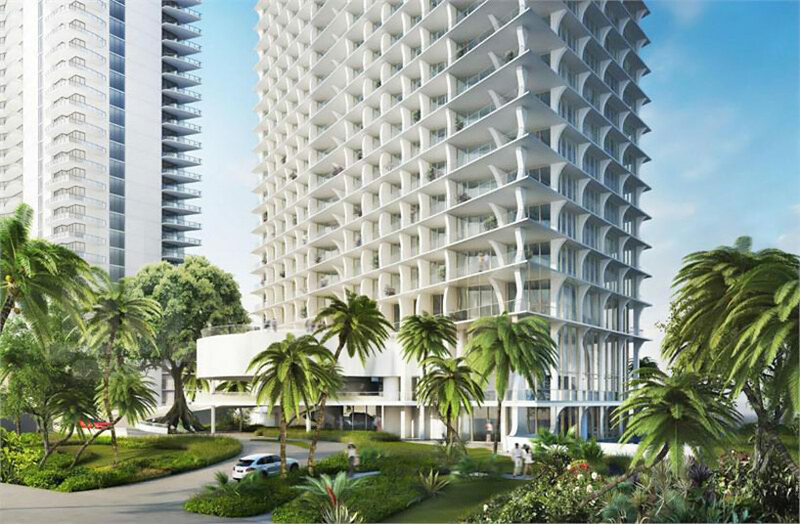 the project aims to appeal to a different demographic that the famously exclusive and ever-changing south beach crowd, making use of the still available beachfront land for the development of a quieter, long-term group of residents. the renderings exhibit a characteristically restrained look that revels in tectonic details. floor-to-ceiling glazing opens the volumes to wide balconies lightly partitioned and bolstered with curved columns. the orthogonality of the miami condo archetype appears to be weathered by a net of recessed curves that tend toward and hourglass form at the structure’s corners, thereby insinuating that the southernmost metropolis is quickly building on an already rich, if not relatively new, architectural legacy. 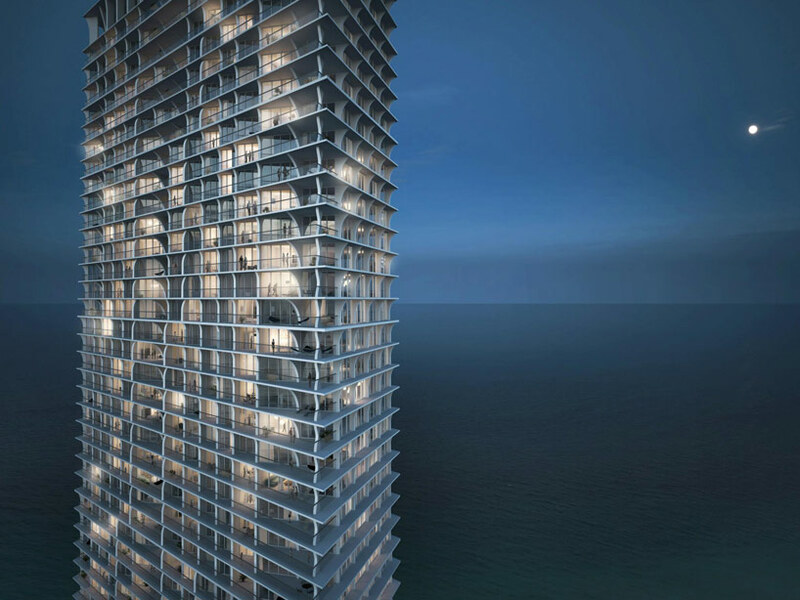 an original version of this article appeared on designboom on may 27th, 2013, at the initial revealing of renders for the jade signature complex. its a pretty subtle move compare with herzog’s previous projects, I almost wish that they played around floor to floor heights in some levels,, they could potentially be penthouses i suppose, kind of like the parking garage they did in Miami. that’s a very interesting project. Oh well! Take the money and run. are going to live there obviously want us to see the new miami skyline. But from where I am okay..Florida has some of the best architecture..very clean, elegant but unlikely a modern marvel maybe from the late 90’s era where they kept blueprints does need to construct it first. The buildings are a bit on the behemoth side what for? aren’t you making enough broadcasting sports. Those could be Casino’s, apartments, government offices, hospitals just from looking at this approach. Even better but oceanfront real estate is very popular amongst the upper classmen need to find investment firms to speak on this lot. Before the construction work gets done the view from the ocean towards the beach is going to be tight in order to get noticed, sometimes you slim down or answer questions. Whatever the cost work as a team get it done. Unlike american designs this is obviously a new edition to a duthc or south american architect looks can be deceiving.